A care-free heaven waits 25 km west of Heraklion Airport. Carved into the cliffside, overlooking the sea, sits Fodele Beach & Water Park Resort. Island bungalows rise next to beautiful gardens. 412 guestrooms reflect centuries of style and culture. With the beach at your feet, vivid views all around, you’ll feel at home as soon as you arrive. Relax with a full body massage or stress-reducing treatment. Dig into unforgettable dining experiences inspired by the world’s great culinary capitals. See the scenery on two wheels or let time fly by on the basketball, tennis and archery courts. While you're at it, why not chill under our gazebos with a cocktail in hand or kick up your feet on our Balinese beach beds? You can also enjoy the gym, scuba club, three swimming pools and recreational sports at your leisure. And don’t miss our water park for the wettest and wildest thrills in Crete. 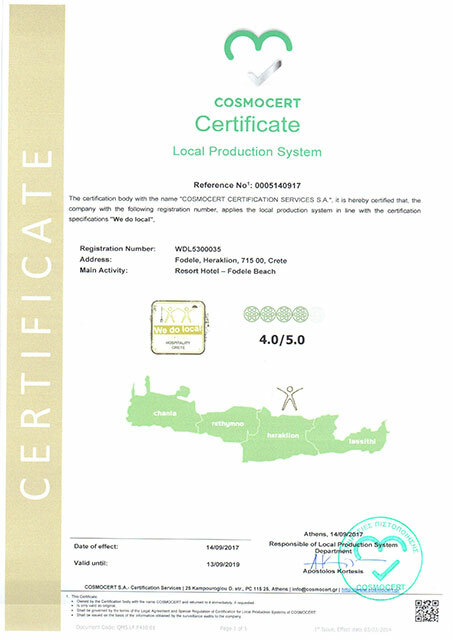 With slides, rides, kids' animation, a windmill snack bar and 950 sq. m. of dazzling pools, you won't find a hotel water park this big anywhere else in the region. 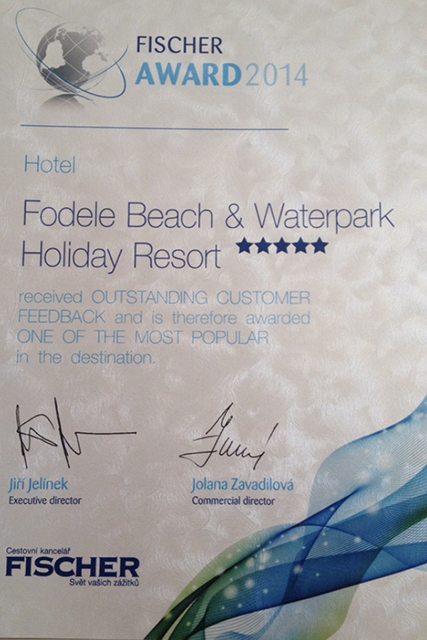 An island, a hotel, a paradise for families, couples and young guests alike, yet Fodele Beach is so much more. It’s an all-in water park wonderland, a world away from the ordinary. Fodele Beach lies in a unique location, on the exquisite sandy beach of Fodele. Our private beach is prepared daily to offer guests an unparalleled beach experience and an exhilarating dip. Our mission is to create an atmosphere that will make you feel truly at home. Three restaurants there awaits an unforgettable array of dining experiences inspired from the world's great culinary capitals. The hotel in general offers incredible opportunities and ideal year-round weather for several indoor and outdoor activities. We welcome you to step into the world of our wellness center, a specially created environment devoted to pamper you with Local and Special Treatments. 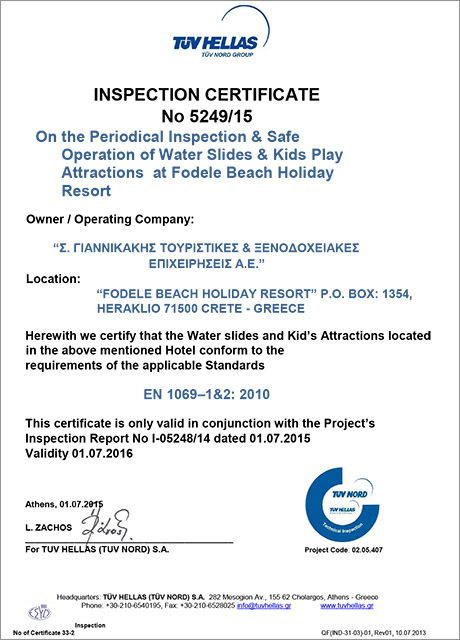 We are proud to offer the wettest and wildest water rides in Crete.